it had deleted a file?? 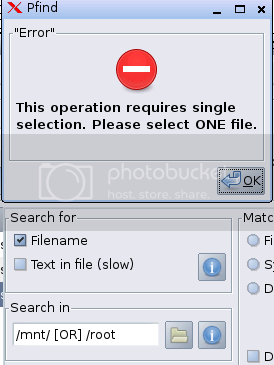 Pfind -> Pfilesearch seems to work for me on Macpup-529(Precise) . 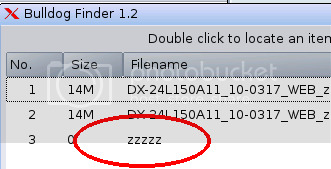 And I have a question about the possibility to alter the 500 files list VALUE in the GUI . please update to the latest version and report back. And another thing : Opera browser thinks he is the very very smart guiy and transforms .pet dl ( and .xz as far as i observed ) into .gz , even with tweaks . I was able to find it with my Bulldog finder. The problem is that /mnt/home is a link. Even if I don't reply, please report bugs here, and I will catch up later. Regarding Don570`s bug report of recent woof built Puppies. I got the same problem with Dpup when I built with recent woof. The /mnt/home is symlink to the /initrd/mnt/dev_save. I dont know if that is the reason why /mnt/home searches fail, but I tested pfilesearch 1.28 - 1.30 - 1.31 -1.32 and pfind 4.25 and pfind 5.04, well, maybe not all possible combinations, but anyway....I couldnt make pfind or using pfilesearch straight to find /mnt/home stuff. It just does not search it. This didnt work: # find /mnt/home -name "ati.pat*"
....but this did work: # find /mnt/home/ -name "ati.pat*"
# find /mnt/home/ -name "ati.pat*"
a link /mnt/home in the next version of Slacko!!! and discovered that it uses a /mnt/home link. on /mnt/home and found it couldn't. So this bug has been in pfind for at least a year !! !